Denver Botanic Gardens is a shining oasis nestled amid the hustle and bustle of the Mile High City. Guests from all over the world come to visit our living collections; to examine, learn and share in our museum of life. But the nourishing earth of the Gardens, like all living things, enjoyed a dark and dangerous past 100 years ago in the Wild West. This land was originally Calvary Cemetery, established in 1860. It was the only Catholic burial ground for the new town of Denver. The Gardens is, then, a cemetery to conservatory story of success and beauty where all is well. But is it? Gale was staffing the information desk in the Boettcher Memorial Center, and as she resupplied maps and brochures, she felt someone behind her. The hair on the back of her neck stood up and a shiver darted down her back. Turning, she saw a shadow. Dark as ink, Gale couldn’t see the wall behind it; simultaneously the shadow slowly faded. Was our volunteer a witness of a haunting echo, one of many apparitions rumored to haunt Denver Botanic Gardens? Or was it just a trick of the light, or maybe something else entirely? These questions only generate more questions. For example, did Gale’s experience arise from an exhumation of three caskets from the heavy slab floor of Gates Hall, renovated in the early 1990s? Similarly, why was Denver County Coroner’s office called when John Sullivan’s remains were discovered intact underneath what was to become the Krohn Building? All solid questions, yet are they tied to Gale’s experience? 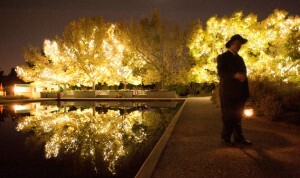 If Gale’s story is just a coincidence, then why are there rumored to be so many ghost stories at Denver Botanic Gardens? Ghosts and history go together, and a good tale can’t be unwound unless a sheet of grisly facts spill out with it. Facts of spectral sightings and grisly folklore will be told in several weekend Ghost in the Gardens tours at our York Street location. These tours are not for the faint of heart and each tour sells out fast. The tours are not appropriate for the 12 and under crowd. Also catch our Bat Encounter: Live! event for those more interested the natural than the supernatural. Those captured by the mischievous fun of the season can enjoy our Corn Maze, Haunted Maze, and Pumpkin Festival - all located at Chatfield. Either way, prepare yourself for an autumn like no other at Denver Botanic Gardens. I was interersted in the 2016 Ghosts in the Graveyard event. As a member, i don't remember ever seeing any information about it. Will there be an event this year? If so, when will it be and when will tickets be made available for purchase? Yes, we will have the Ghosts in the Gardens tours this fall. Dates are still being finalized. Tickets will be available online. Check our catalog http://catalog.botanicgardens.org/default.aspx later this summer or send email to registrar@botanicgardens.org for more details.